3,359 participants from 53 nations in the Pohang Gymnasium for 4 days from the 21st of August. The Taekwondo Hanmadang was founded by Kukkiwon in 1992. Even though Taekwondo became a world-renown sport, Kukkiwon was concerned about the regression of various qualities of Taekwon as a martial art due to the competitive style of games that were common. The Taekwondo Hanmadang played many roles. One of its roles was to provide a place for showing the spirit of Korean Taekwondo with improvements to the Taekwondo techniques. Also, it had become a place where harmony and unity were promoted for the Taekwondo family around the world. Therefore, The Taekwondo Hanmadang is not only a festival where we can encounter Taekwondo as a sport but also a place where Taekwondo people can demonstrate their skills in martial arts. Until 2005, Taekwondo Hanmadang was held only at Kukkiwon and in Seoul. But beginning in 2006, Muju in Jeollabuk-do Province, and other cities in Korea began hosting the Taekwondo Hanmadang. It continuously functions like an honorary ambassador that advertises and informs the public about Taekwondo and the host city. In 2008, The Taekwondo Hanmadang was held at the California Anaheim Convention Center. One-hundred-twenty-four teams composed of 1149 players joined the Taekwon Hanmadang and received a standing ovation from the Americans for showing them the quintessential Korean Taekwondo. Taekwondo Hanmadang has two divisions of competition: individual and group. 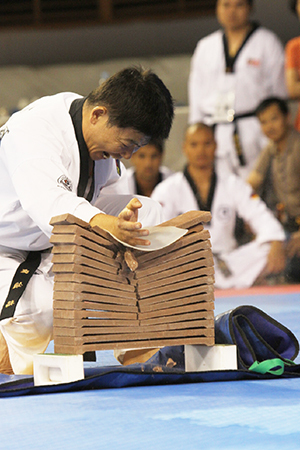 The individual division consists of 39 entries in 7 categories such as Power Break (fist, hand blade, foot), All-round Break, Record Contest Break (high-jumping, far-jumping), and Authorized Poomsae. The group division consists of 20 entries in 5 categories: Authorized Poomsae (doubles/group), Creative Poomsae, Taekwondo Aerobics, and the Team Competition. Specially for this year, the possibility of Master KyuHyun Lee(68)'s third successive championship in the Men's Authorized Poomsae Master II, and Master YoungAe Seo(53)'s becoming the top Women's Authorized Poomsae Master I for the 8th time, has drawn the attention of players and participants. Also, the entrance of some of the nation's Power Break winners, Master GilJae Bae(51) and JinBok Bae(54), add particular interest to the Gyeokpa (break) entry. 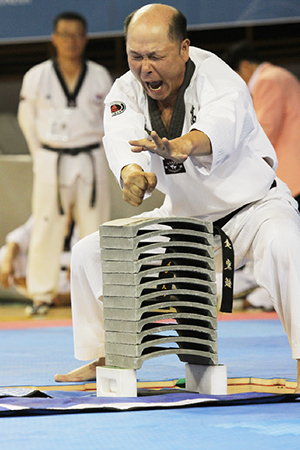 Participants in the 2013 World Taekwondo Hanmadang are displaying their skills. Last year's International Hand Blade Break Senior III champion from the United States of America, Christopher Blobelt(57)'s challenge to Authorized Poomsae Senior III is gaining attention, especially given his condition of interilioabdominal amputation. After losing his right foot because of the Taliban in Afghanistan, it was inevitable for him to have to use a prosthetic leg. However, Blobelt claims that he has regained his confidence and health through Taekwondo. He added, "I entered the competition to spread hope and courage through Taekwondo to those in pain and with disabilities," which has created a sensation among the participants. In the group division, the existence of an opposing team for the Sehan University Team remains in question. The Sehan University Team has won in Domestic Team Competition Senior I and II for 4 successive years, confirming that they are the top ranking team in the domestic division. Another interesting element is regarding the youngest and the oldest player. It is stated that any Poom/Dan holder issued by Kukkiwon from participating nations is qualified for the entire competition, except for the Power Break and the Authorized Poomsae. In accordance with this regulation, the youngest player for this year's competition is JiHwan Seon(6) and the oldest is Master HeungTaek Huh(69) of American nationality, creating a 63-year age gap between the two. 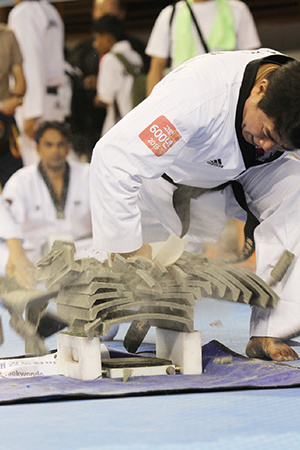 Kukkiwon has prepared some big changes prior to the competition. The first is a one-hour Taekwondo Gala Show. It is the first in Taekwondo Competition history and will be held on the 23rd, the day before the closing day. The organizers have not yet approved the contents of the show, however, it is expected to be a fusion of Taekwondo and culture. Pohang's representative history of 'YeonO and SeoO' will be shown and displayed by the previous years' champions and participants in diverse forms and stories such as the 'Magic and Taekwondo,' 'IT and Taekwondo,' and 'Wire Actions and Taekwondo.' This year's Gala Show is highly anticipated, especially because it will convey the message of the extensive studies at the 'YeonO and SeoO Research Institute' built by Kyongbuk Press. The second change is that the competition will be broadcasted live all over the world on the Kukkiwon website (www.kukkiwon.or.kr), as well as over SNS coverage of news, media, and the competition results. Furthermore, there will be side events to make the competition even more plentiful, such as the Grupo Vocal Millennium from Spain, the On-line Gyeokpa Championship, the Foot Kick Breaking Speed Competition and the Virtual Reality Taekwondo Experience. 태권도 한마당은 스포츠화를 통해 태권도를 세계에 알리는 데는 성공했지만 겨루기 위주의 경기만 치르면서 격파와 품새 등 무예로서의다양한 가치가 퇴보하는 것을 방지하기 위해 국기원이 지난 1992년 창설한 대회다. 따라서 태권도 한마당은 무예정신의 발현과 태권도 기술 향상은 물론 지구촌 태권도 가족들의 화합과 단결을 도모하는 종합경연장으로 자리를 잡아 왔다. 즉 태권도 한마당대회는 스포츠경기로서의 태권도가 아니라 무예로서의 태권도를 수련중인 태권도인들의 경연장이자 축제라고 말할 수 있다. 이런 목표아래 2005년까지 국기원과 서울에서만 열리던 대회를 2006년 무주대회를 시작으로 전국 주요도시를 돌며 개최해 태권도를 알리는 것은 물론 해당 지역을 세계에 알리는 홍보대사역할을 맡아오고 있다. 특히 지난 2008년 미국 캘리포니아 애너하임 컨벤션센터에서 열린 대회에서는 세계 각지에서 출전한 124팀 1천149명의 선수단이 미국민들에게 한국 태권도의 진수를 선보여 박수갈채를 받았다. 태권도 한마당 경연종목은 개인종목으로 △위력격파(주먹·손날·발) △종합격파 △기록경연(높이뛰어격파·멀리뛰어격파) 등 격파 6종목과 공인품새(이상 개인전) 1종목 등 7종목 39개부문에 걸쳐 열린다. 단체전은 △공인품새(복식·단체) △창작품새 △태권체조 △팀 대항 종합경연(이상 단체전) 등 5개 종목 20개 부문에 걸쳐 경연을 갖는다. 특히 이번 대회에서 관심이 쏠리는 부문은 남자 공인품새 마스터Ⅱ(60세 이상)부문 이규현사범(68)의 3연패 달성 여부와 세계품새선수권대회서 지난 2006년부터 7번(2011년 제외)이나 우승한 서영애사범(53)의 여자 공인품새 마스터Ⅰ정상 등극 여부에 관심이 모아진다. 격파부문에서는 국내 주먹격파 마스터 통합부문 우승자 배길재사범(51), 지난해 우승자 배진복사범(54) 등 국내 위력격파 고수들이 모두 출전해 흥미를 더해줄 전망이다. 또 하지절단장애에도 불구하고 지난해 대회서 해외 손날격파 시니어III부문 챔피언에 오른 미국 크리스토퍼 블로벨트(58)씨는 이번 대회 공인품새 시니어III부문에 도전, 눈길이 쏠린다. 아프가니스탄에서 탈레반 폭탄 테러로 오른발을 잃은 그는 의족과 목발로 겨우 보행이 가능했지만 태권도를 통해 자신감 회복과 건강을 되찾았다. 그는 지난해 대회에 앞서 "자신과 같이 장애로 고통 받고, 힘겨워하는 사람들에게 태권도를 통해 꿈과 용기를 주고 싶어 출전했다"고 밝혀 큰 감동을 줬었다. 단체전에서는 대회 4연패의 위업을 이룬 세한대 태권도팀을 넘어설 팀이 있는가다. 세한대는 지난해까지 국내 팀 대항 종합경연 시니어 Ⅰ·Ⅱ 통합 부문은 4연패를 이루며, 국내 최정상임을 확인시킨 팀이다. 또다른 관심은 최연소 및 최연장 출전선수다. 출전자격은 국기원이 발행한 품·단증 소지자로 출전국 국적 또는 영주권 소지자는 누구나 참여할 수 있지만 위력격파, 공인품새 종목은 나이제한을 뒀다. 이런 규정에 따라 이번 대회 출전신청을 받은 결과 최연소자는 만 6세인 선지환군이며, 최연장자는 만 69세인 미국국적의 허흥택사범으로 두사람간 나이차가 무려 63살이다. 국기원은 이번 대회를 앞두고 큰 변화를 준비했다. 먼저 대회 폐막전날인 23일 오후 8시부터 1시간동안 역대 대회최초로 마련하는 태권갈라쇼다. 주최측은 갈라쇼의 전체적인 내용을 밝히지는 않았지만 포항의 대표적 역사인 '연오랑 세오녀'를 스토리텔링화시켜 역대 우승자와 참가자들이 출연해 '마술과 태권도', 'IT와 태권도', '와이어 액션과 태권도' 등 옴니버스 형태로 펼쳐 태권도와 문화가 융합될 수 있음을 보여줄 것으로 기대된다. 경북일보가 연오랑세오녀연구소를 설치해 집중 연구하면서 매년 세미나를 개최해 오고 있어 이번 갈라쇼는 그 의미가 클뿐 아니라 지역민들의 관심을 모을 것으로 보인다. 이들과 함께 출연하는 태권도 시범단의 시범 등을 통해 태권도의 진정한 멋을 볼 수 있다. 또다른 변화는 대회 경연과정을 국기원 홈페이지(www.kukkiwon.or.kr)를 통해 전세계에 인터넷 생중계하며, SNS를 활용해 각종 소식과 사진·영상·경연결과를 알릴 계획이다. 이외에도 스페인 밀레니엄 합창단 내한공연·온라인 격파왕·발차기 스피드대결·가상현실 태권도 체험 등 부대행사가 열려 한마당을 더욱 풍성하게 만들 전망이다.